Last week, during the days 23 to 25 October, the " Workshop on Carotenoids in Food, Nutrition and Health ", organized by the IATA Post-harvest Physiology, Pathology and Biotechnology Group , as a member of the European Network EUROCAROTEN (European Network to Advance Carotenoid Research and Applications in Agro-Food and Health). 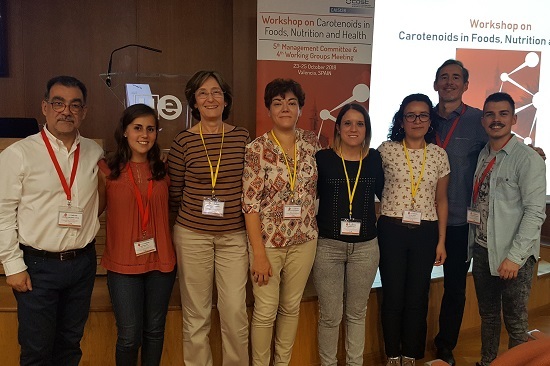 The objective of this congress was to discuss critically and scientifically the controversies and advances in the area of ​​carotenoids in the science of food and nutrition, focusing on the aspects related to their appearance in foods and aspects related to health. It should be noted that the primary objective of EUROCAROTEN is to improve the competitiveness of the European agri-food industry and promote health by coordinating research on carotenoids.